What do you think your inkjet printer can create? Pages of black text? OK. Documents with color graphics? All right. Photos of you having fun in backyard? Absolutely! Anything else? You surely feel puzzled, however an inkjet printer can do a lot more. And there are people who know what this ‘more’ is. A UK start-up, Polymertronics, develops a method that combines organic semiconductor fabrication technology with ultra-violet (UV) curing techniques. Simply put, this means there is a way to print electronics on a variety on media including vinyl, plastics, glass and metal. In particular, using this method one can create embedded light emitting diodes (OLEDS) and touch sensitive panels. The crucial thing about the technique is that it implies using existing printing equipment. This automatically creates a sales market for Polymertronics products and makes them (products) more cost effective. Printed electronics sounds exiting, but hey, what do you think of printed bones? Researchers at the Tissue Engineering Department at the University of Tokyo Hospital have already performed several implantations of artificial bones in male and female patients, ranging in age from 10 to 54. The artificial bones were simply printed using 3-D inkjet printers. Actually, here is what that “simply” means. Artificial bone is created in several steps. First, a 3D computer model of the bone is created using the patient’s X-ray and computed tomography scan data. Then, the 3-D model is sliced into tons of layers, and the data is sent to special 3D inkjet printer. The printer work similarly to regular inkjet printer, but it does not produce simply one layer of ink droplets on paper. Instead, it creates multiple layers by applying water-based polymer adhesive onto special powder, which then hardens. 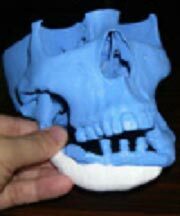 Repeatedly printing layers on top of one another, printer creates a replica of desired bone or its part, see photo (taken from www.pinktentacle.com). This entry was posted on Wednesday, August 22nd, 2007 at 3:29 am	and is filed under inkjet, innovation, printing, research, technology. "HP, Epson and Canon Introduce New Printers"
"New Printers Annouced. Trios From Epson and Canon."